One of my biggest resolutions when I turned 30 is to dress better. And by that I mean, forgoing the tempting and cheap fast fashion for some quality and classic pieces. I too often have a million pieces of clothing yet nothing to wear! Do you have the same issue? Even though I loved this galaxy pattern long t shirt, you can see that is is kind of pulling and the back was pilling after just a few washes. Alas, I have an explanation for my madness – and even a solution! Living in New York City and using public laundromats does not do your clothes ANY favors whatsoever. And washing clothes at $4-6 per lbs, it is actually cheaper to buy new clothes all the time! But now that I have moved into a house in Las Vegas with my own laundry, the world of fashion-caring and responsible shopping has emerged. Dryel makes clothes look newer longer. This is the first at home dry cleaner that harnesses the power of your own dryer to clean and deodorize clothing! The best part is that it is also environmentally friendly as well. 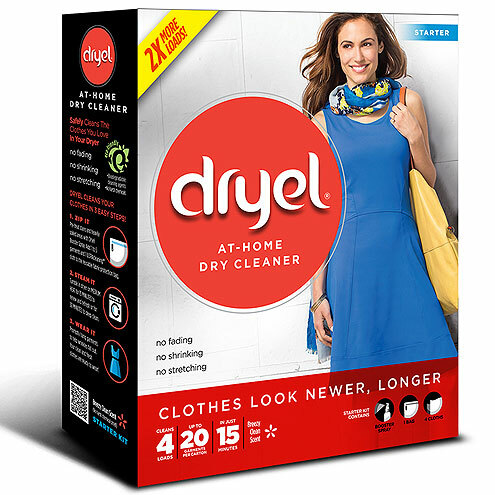 Dryel is a patented at-home dry cleaning process that is easy to use. You can quickly refresh and renew your clothes in only 15 minutes in the dryer. Or for clothes that need a deep clean, use our booster spray and tumble in the dryer for 30 minutes. Dryel safely and thoroughly cleans clothes, protects colors and preserves shapes without any harsh chemicals. It ‘steams’ the laundry in your dryer inside the Dryel zip pouch. It is so simple and fun to use! These are some of the new items on my shopping list now that I have Dryel to help with cleaning them. Let me know which ones you think I should get. I can finally invest in dry clean only and delicate hand wash items without any worries.